22, British girl living in Stockholm. 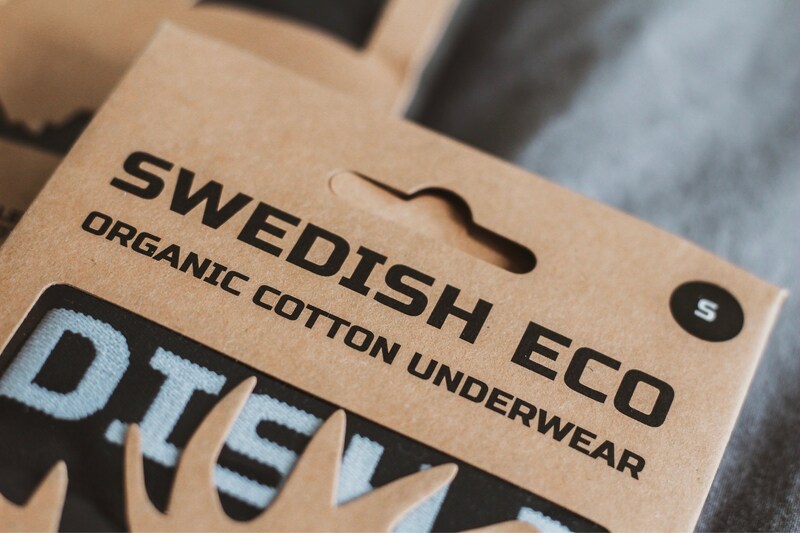 Swedish Eco- the underwear everyone deserves! 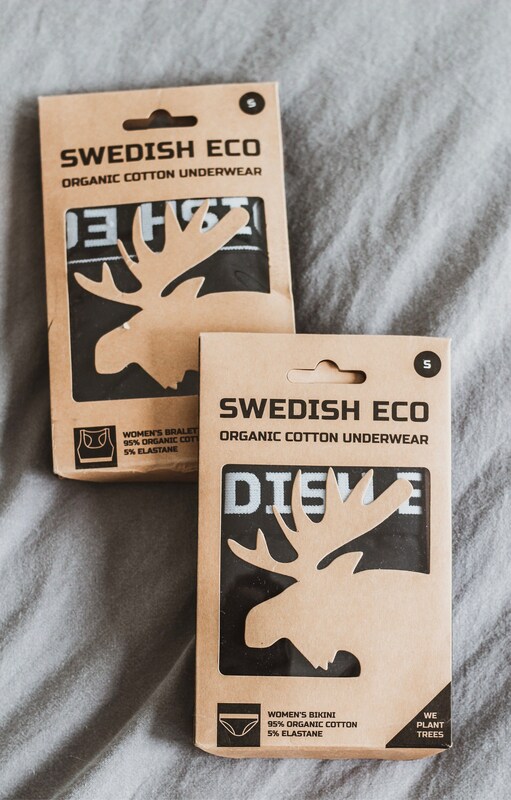 I recently came across Swedish Eco on Instagram when I was on the hunt for some new and more comfortable underwear. I have been reading so many reports about how unhealthy it is to wear fabrics that are not breathable or organic around your most sensitive areas and wanted to give my body the very best it deserved. 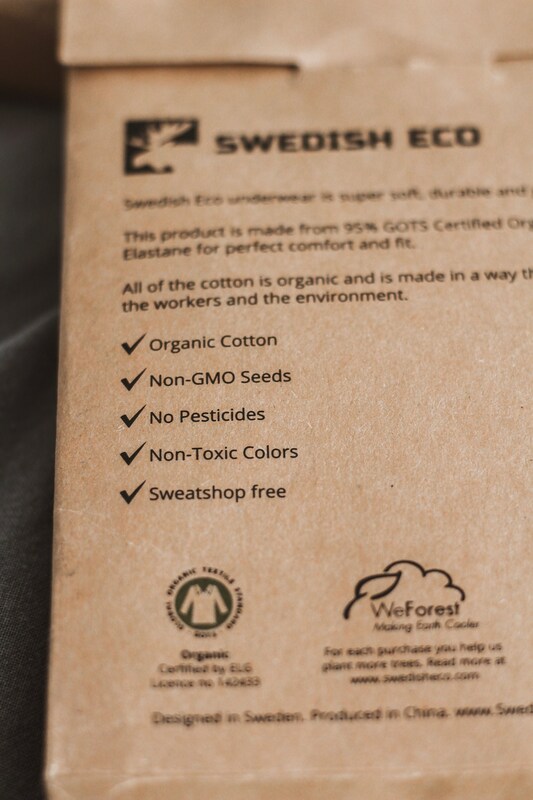 One of my favouriteparts of Swedish Eco is the quote ‘Manufacturingprocess is designed to be good from seed to shelf’, it really means so much to know what Iam wearing is not only good for me, but also the people along the process whomake my clothing. I have both sets in black and grey, I love both but thought I’d show you my black set now and more pictures will be coming soon in grey too! I love that it is a super simple style, that works with everything I wear. They are also super soft, so I wear mine all the time! They have two styles of bottoms for women, bikini briefs and minishorts. The bikini briefs featured on me are my favourite, this sit really comfortably and don’t ride up my bum (personal hate with some underwear) but the shorts are also super comfy, I actually lounge around with them at home a lot. I also love how earth friendly these products are, a perfect small change in your day to day life that can make a huge impact. Listed in the picture below are all the things they are! They make me feel super comfortable and give me a little extra boost of confidence in my skin. I would highly recommend if you are looking to listen to your body more and give it the love and softness it deserves, then Swedish Eco is a great place to start! The webiste for Swedish Eco is tagged here. This is a gifted post but like always, all opinions thoughts and words are my own! I am a little obsessed with socks, no matter what I am wearing I always like to have a colourful or cute pair of socks on. However, I think it is super important for everything I put on my body to be sustainable and a good material. 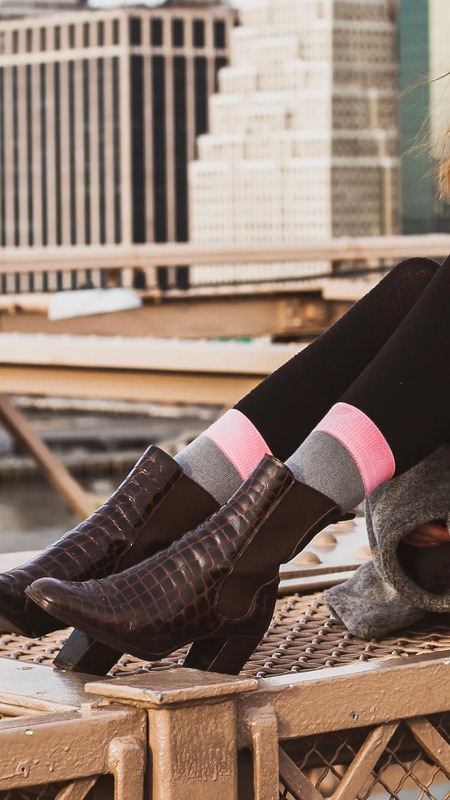 I recently came across this company Kind Socks on Instagram and was instantly taken away by their cute designs, unisex availability and what they stand for. What more could you want from socks? I absolutely love the fact that we have the option to not only support companies that care about the rest of the world, but to be able to spend our money on products that care for us. 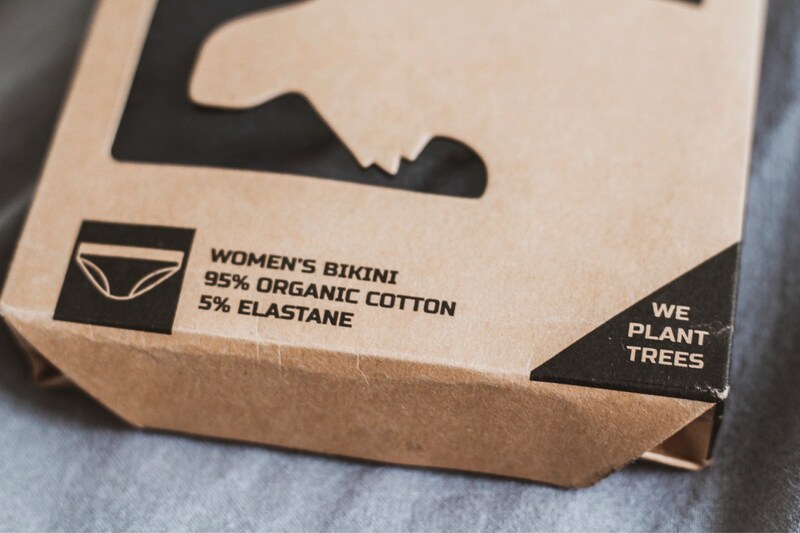 If you think about the normal socks you buy from H&M or Zara, you can almost always assume they are using pesticides in their cotton production, and chemicals in the warehoused for packing and so on, and then you put that on your skin and wear it all day long. Your skin is your largest organ, you shouldn’t be putting anything on that isn’t natural and good for you. 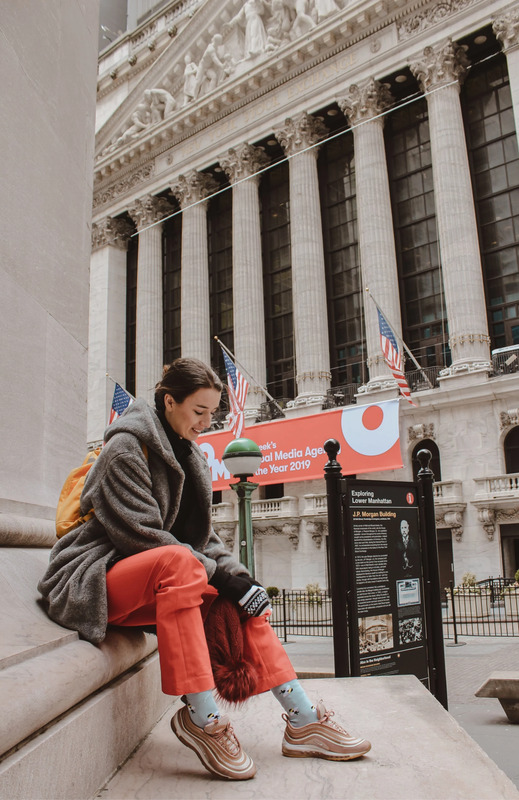 With the constant news on how we need to be more sustainable because time is running out, I think it is nice to treat yourself to something fun and exciting that still allows you to care for the planet and yourself. These socks are comfortable, soft and very functional. They are super easy to wash, just turn them inside out, and wash at 40C, I am always a little more carful with my organic delicates and do a wash at 30 and then hang dry them after. I love wearing them just as they are or as an added colour over some tights in my boots. 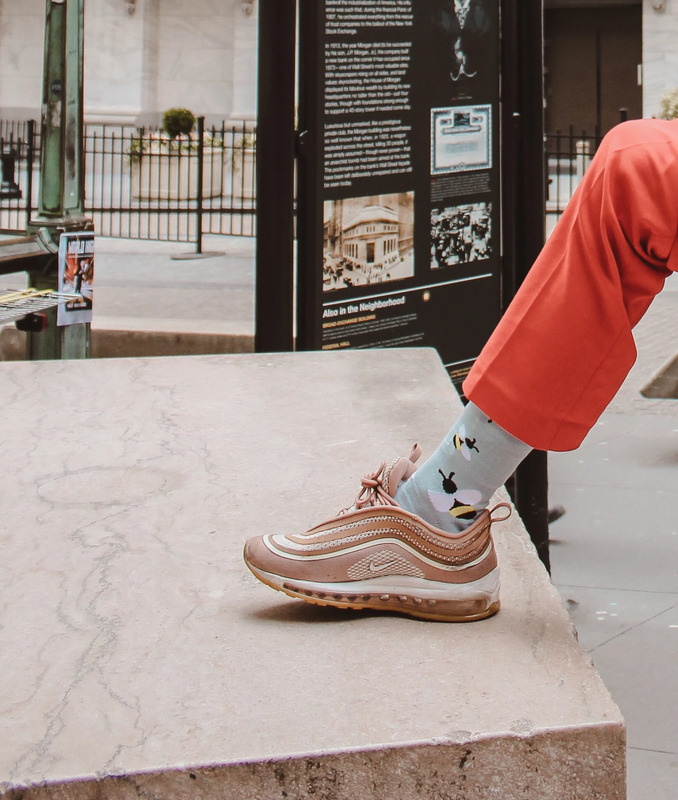 You can check them out here https://www.kindsockswear.com/! These socks were gifted. As always, all opinions, thoughts and ideas are my own. Let’s talk second hand, now I am sure you all know how much I love to shop second hand. I explained it to a friend the other day as a therapy, whenever I get stressed or just need to escape I put my headphones in and dive into one of the huge stores here in Stockholm. However, whenever I mention second hand to people they always say, “oh but I never find anything good”. Well first, if you went once and didn’t find anything then… go figure. I don’t walk into every shop and find cute things. Secondly, you really need to look, yesterday when I was walking through the third shop still empty handed I was like ugh this is rubbish and was ready to give up but then I realised I was just skimming, the treasures are always hidden, I ended up finding 5 different cute items. And finally, but this more depends on your dedication, you can’t take everything at face value. Most of the stuff I find doesn’t fit 100% or isn’t completely what I want, but I have a weird body shape so if I let that hold me back I would never find anything. You need to be open and already have in mind what sort of things you want, second hand is overwhelming, everything is pushed into one room and is never organised by size, if you have an idea of at least colours, then you’ll find the process a lot less overwhelming. One of my favourite parts of second hand is finding a project, a clothing item that needs to be resized or something that needs a little love and care. 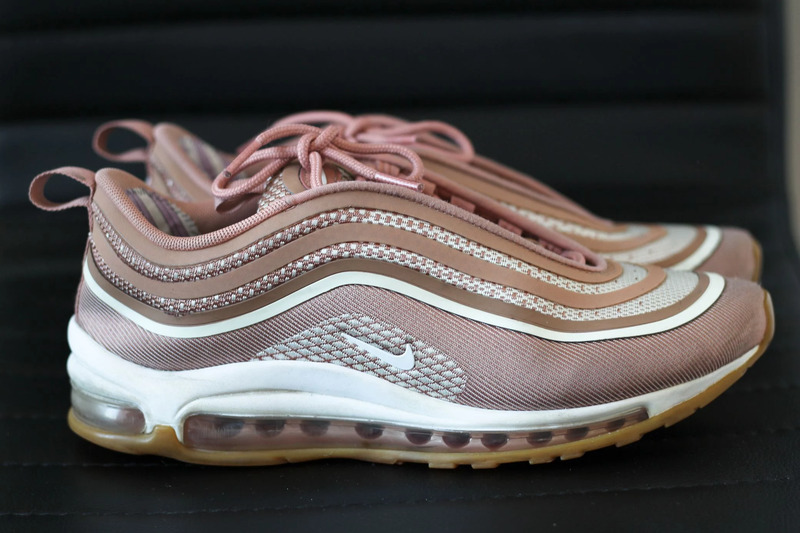 During my recently hunt, I found a pair of Nike Air Max 97, I have been looking at buying these for a long time but never really wanted to invest the money. 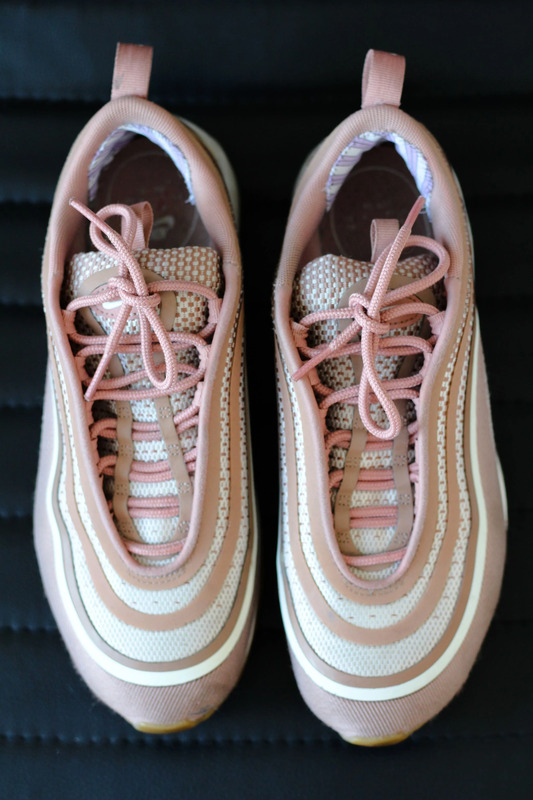 These shoes were my size and the colour I wanted, I couldn’t believe my luck. 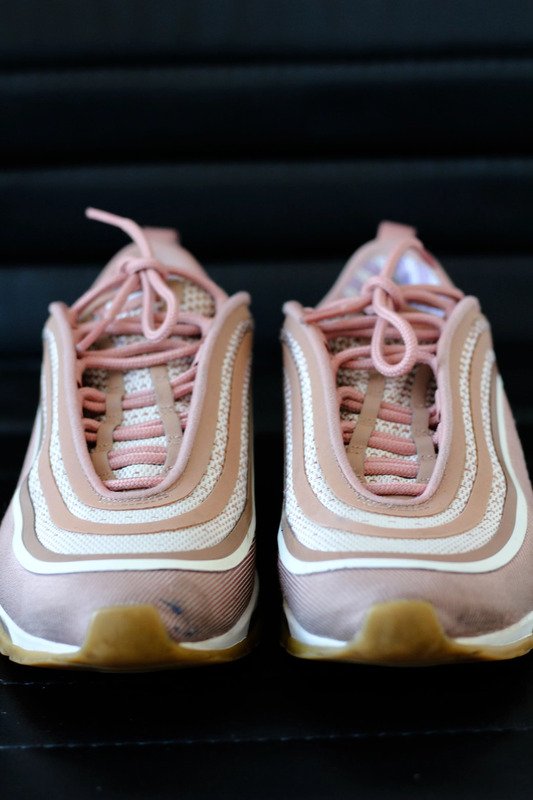 The only problem was they were scuffed and the back of the heel had holes in the material. When I checked the price 60SEK (£5) I couldn’t say no. They came home with me and the project began. To begin with I took a tooth brush and soapy water and began scrubbing them, I took away a lot of the hard dirt and just cleaned away any smell or dust lingering. Then I took a rubber and rubbed all the white sections, this removed most of the black marks and gave it a fresh look. Finally, I cut out little scraps of material to put on the heel and stitched it in. I did a few layers to make it more cushioned so that it wouldn’t hurt my heels. After washing the laces and spraying the shoes a little, they look pretty good! 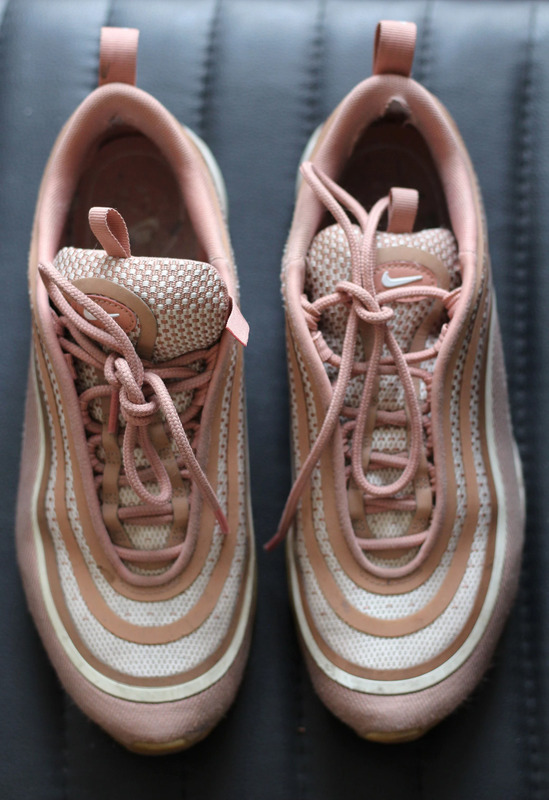 I might try washing them in the washing machine as I saw some youtubers do the same, but its muddy and wet outfit so for now its perfect. 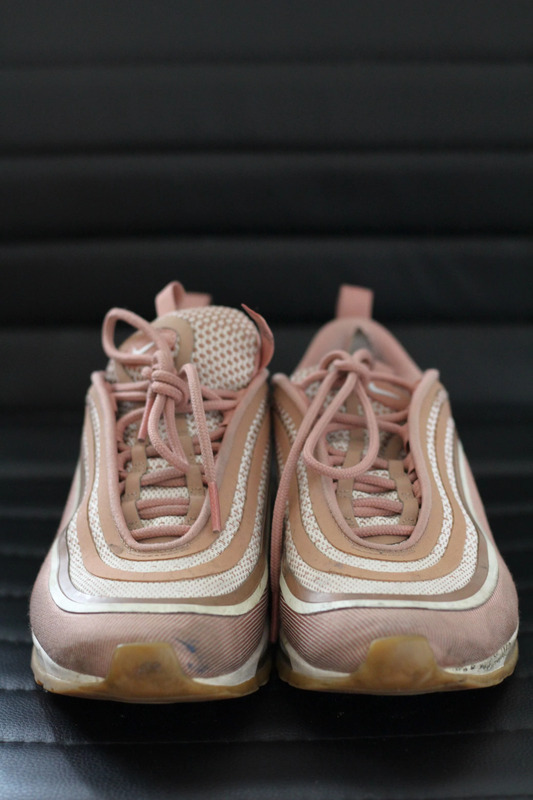 I took some before and afters, so you can see what a little attention can do to not only shoes if you buy them second hand, but also for your shoes at home. Caring for them, especially leather shoes can make them last a lot longer. I hope you like the transformation, I can assure you, they will be in a lot more pictures coming up this month! 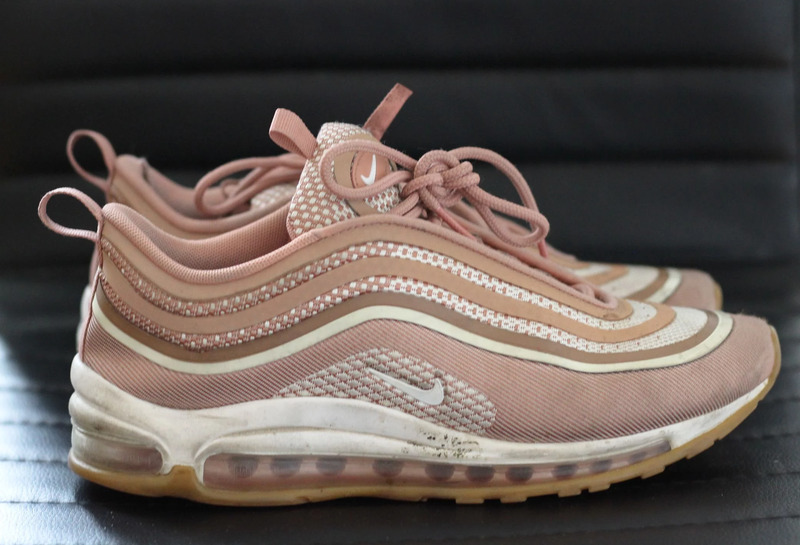 I am going on a trip next week, so these will be my go to shoes for sure! I am going to do everything I can to get rid of the taboo of second hand, it will make such a difference to your bank account but also helps save the planet! One mans trash, is another mans treasure!